Don’t ban email—change how you work! How often do you hear things like “let’s ban email”, “no more attachments”, “death to PowerPoint decks”, “we’re going paperless”, “meeting free friday” or one of dozens of “bans” designed to do away with something that has become annoying or inefficient in the workplace? If you’re around long enough you can see just about anything cross over from innovative new tool to candidate to be banned. The problem is that banning a tool (or process) in an attempt at simplification never solves the problem. 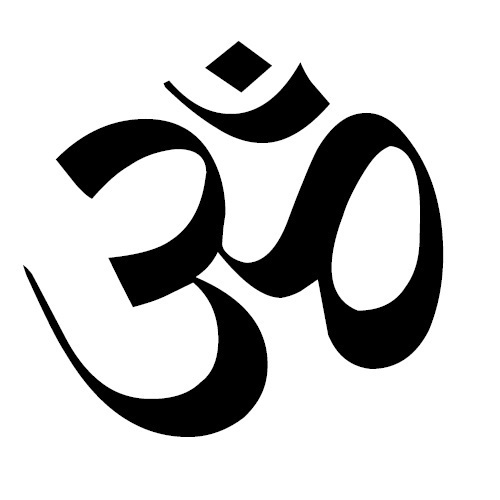 Rather, one should to look at a different approach, an approach that focuses on the work not the tool or process. 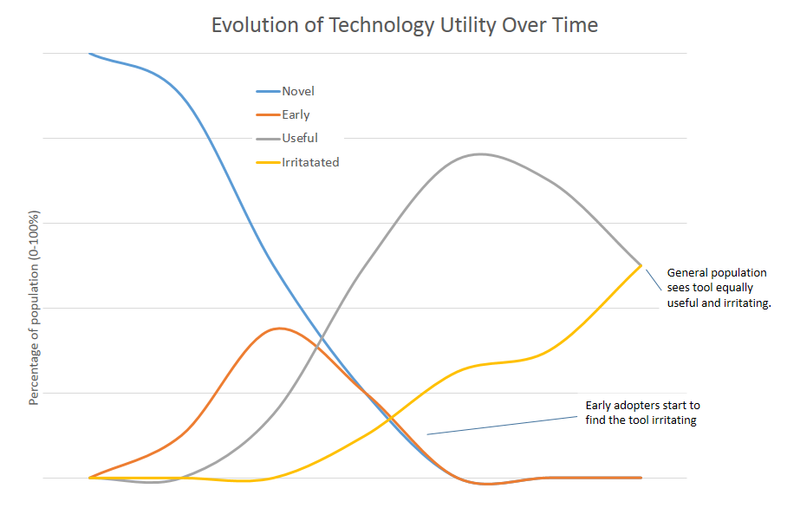 It is well understood that new technologies go through an adoption curve. In the classic sense it is a normal distribution as described by researchers in the 1950’s. More recently and generally cited in the software world is Geoffrey Moore’s Crossing the Chasm which describes a slightly different path. These models all share a common view of a group of early adopters followed by a growing base of users of a technology. While adoption is great, we are all too used to experiencing excess enthusiasm for new technologies. As a technology spreads, so does the enthusiasm. Invariably some folks use the technology to the the point of abusing it. From reply all to massive attachments to elaborate scorecards with more dimensions than anyone can understand, the well-intentioned enthusiastic user turns a game-changing tool into a distraction or worse. Just as with adoption curves, once can create a conceptual “irritation curve” and overlay it with adoption. Of course what is pictured below is not based on any data or specific to any technology, but consistent with our collective anecdotal point of view. The key is that at some point the adoption of a new product crosses the chasm and becomes widely used within a company. While there is a time delay, sometimes years, at some point the perceived “abuse” of the technology causes a cross-over where for some set of people the irritation outpaces the utility. Just as there are early adopters, there are also irritation canaries who are the first to feel the utility of the new technology declining with increased usage. We see this same dynamic not just for tools, but for business processes as well. That status report, dashboard, or checkin mail all start off as well-intentioned and then after some period of time the “just one more thing” or spreading over-usage at all levels of a team turn a positive into a burden. Then at some point people start to reject the tool or process. Some even call for an outright ban or elimination. The way to break the cycle is to dive into the actual work and not the tool. Historically, tools fade away when the work process changes. It is tough to find examples of popular tools and processes that were simply banned that did not make a comeback. Companies that ban meetings or email on fridays just have more meetings and email on monday-thursday. I’ve personally seen far too many examples of too much information crammed on to a page (smaller fonts or margins anyone) or slides that need to be printed rather than projected in an effort to squeeze more on a page when there are forced limits on story-telling. On the other hand, from voice mail to fax machines to pagers to typewriters to voice calls we have examples of tools that achieve high and subsequently irritating usage levels can and do go away because new tools take over. If you were around for any of those then you know that people called for them to be banned and yet they continued, until one day we all just stopped using them. A favorite historical example is a company that told me they removed all the typewriters when PCs were introduced. The company was trying to save time because typewriters were much more difficult to use than PCs with printers (of course!). The problem was immediately seen by those responsible for the workflows in the company–all of a sudden no one could fill out an expense report, transfer to another department, or pay an invoice. All of these work processes, the blizzard of paperwork that folks thought were caused by typewriters, were rendered inoperable. These processes all required a typewriter to fill out the form and the word processors had no way of navigating pre-printed forms in triplicate. Of course what needed to happen was not a pre-printed form that worked in a word processor (what the administrative folks asked for), but a rethinking of the workflow that could be enabled by new tools (what management needed to do). This sort of rethinking of work is what is so exciting right now. It is fair to say that the established, and overloaded, desktop work-processes and tools of the past 20 years are being disrupted by a new generation of tools. In addition to re-imagining how work can be done to avoid the problems of the past, these tools are built on a modern, mobile, cloud, and social infrastructure. For example, Tom Preston-Werner, co-founder of GitHub, tells a great story about the motivations for GitHub that echoes my own personal experience. As software projects grew the communication of code changes/checkins generate an overwhelming blizzard of mail. Rather than just shut down these notifications and hope for the best, what was needed was a better tool so he invented one. At Asana, Dustin Moskovitz, tells of their goal to eliminate email for a whole set of tracking and task management efforts. We’ve all seen examples of the collaborative process playing out poorly by using email. There’s too much email and no ability to track and manage the overall work using the tool. Despite calls to ban the process, what is really needed is a new tool. So Asana is one of many companies working to build tools that are better suited to the work than one we currently all collectively seem to complain about. Just because a tool is broadly deployed doesn’t mean it is the right or best way to work. We’re seeing new tools that are designed from the ground up to enable new ways of working and these are based on the learning from the past two decades of tool abuse. What are some warning signs for teams and managers? It is easy to complain about a tool. Sometimes the complaints are about the work itself and the tool is just the scapegoat. There’s value in looking at tool usage or process creation from a team or management perspective. My own experience is that the clarion calls to ban a tool or process have some common warning signs that are worth keeping an eye out for as the team might avoid the jump to banning something, which we know won’t work. Who is setting expectations for work product / process? If management is mandating the use of a tool the odds of a rebellion against it go up. As a general rule, the more management frames the outcome and the less the mechanism for the outcome the more tolerance there will be for the tool. Conversely, if the team comes up with a way of working that is hard for outsiders to follow or understand, it is likely to see pushback from partners or management. However, if it is working and the goal is properly framed then it seems harmless to keep using a tool. Teams should be allowed to use or abuse tools as they see fit so long as the work is getting done, no matter how things might look from outside. Does the work product benefit the team doing the work or the person asking? A corollary to above is the tool or process that is mandated but seems to have no obvious benefit is usually a rebellion in-waiting. Document production is notorious for this. From status reports to slides to spreadsheets, the specification by management to create ever more elaborate “work products” for the benefit of management invariably lead to a distaste for the tool. It is always a good idea for management to reduce the need to create work, tools, and processes where the benefit accrues to management exclusively. Once again, the members of the team will likely start to feel like banning the use of the tool is the only way to ease the overload or tax. Do people get evaluated (explicitly or implicitly) on the quality of the work product/process or the end-result? A sure-fire warning sign to the looming distaste of a tool or process is when a given work product becomes a goal or is itself measured. Are people measured by the completion of a report? Does someone look at how many email notifications get generated by someone? Does someone get kudos for completing a template about the group’s progress? All of these are tools that might be considered valuable in the course of achieving the actual goals of the team, but are themselves the path along the way. Are your status reports getting progressively more elaborate? Are people creating email rules to shunt email notifications to a folder? Are people starting to say “gosh I must have missed that”? All of those are warning signs that there is an impending pushback against the tool or process. What doesn’t get done if you just stop? The ultimate indicator for a need to change a tool or process is to play out what would happen if you really did ban it. 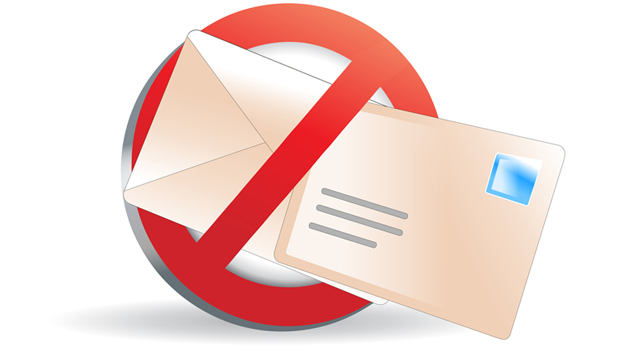 We all know that banning email is really impractical. There are simply too many exceptions and that is exactly the point. Many tools can have a role in the modern workplace. Banning a tool in isolation of the work never works. Taking a systematic look at the work required that uses a tool, those that use the tool, and those that benefit from the output is the best way to approach the desire to use the most appropriate toolset in the workplace. What tools need to change in your organization? What work needs to change so that the team doesn’t need to rely on inappropriate or inefficient tools? PS: As I finished writing this post, this Forrester report came across twitter: Reality Check: Enterprise Social Does Not Stem Email Overload.